"Members of the Horace M. Warren Post No. 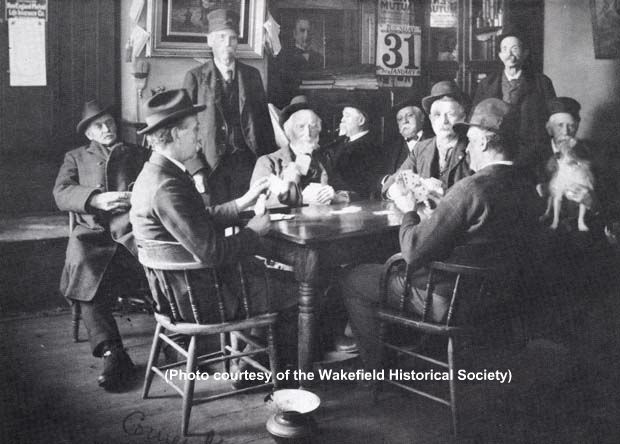 12 of the G.A.R., 'ex-soldiers of the War of 1861-1865' often met at the group's 'corner' of the hall on Foster Street. The building, once part of the old South Reading Academy, was dedicated on December 29, 1892. The H.M. Warren Post was chartered on August 16, 1867, and was named in memory of Horace M. Warren, a member of the Richardson Light Guard's Company B, 5th Regiment at Bull Run and the 20th Regiment at Ball's Bluff where he was severly wounded. He went on to serve as 1st Lieutenant in Company E, 50th Regiment (Richardson Light Guard) in the Port Hudson, LA campaign, and 'in the Wilderness under Grant, and at Cold Harbor, Petersburg, VA.' He was later named Adjutant and Major in the 59th Regiment, Veteran's Infantry. He was mortally wounded on the Weldon Railroad Battlefield in August, 1864. The first meeting of the Post was presided over by William Tyler, Provisional District Commander of Section No 6. and formal organizer of the post. The officers were installed by Grand Commander Austin S. Cushman of the Department of Massachusetts at South Reading." -- Text from calendar by Jayne M. D'Onofrio. Pictured in the photo: William G. Skinner, John M. Cate, Capt. John H. Perkins, Messieurs Hayden, Cowdrey, Burchstead, Madden and Charles Evans. “Grand Army Hall, Foster Street, 1905,” NOBLE Digital Heritage, accessed April 22, 2019, https://digitalheritage.noblenet.org/noble/items/show/6959.